I like its elegant simplicity. Goes well with still life or landscapes. The frame is very nice and a very high quality. I'm really pleased with the purchase. This frame was the best match for the oil painting I used it for! I did a whole guest bedroom in pictures with this frame. 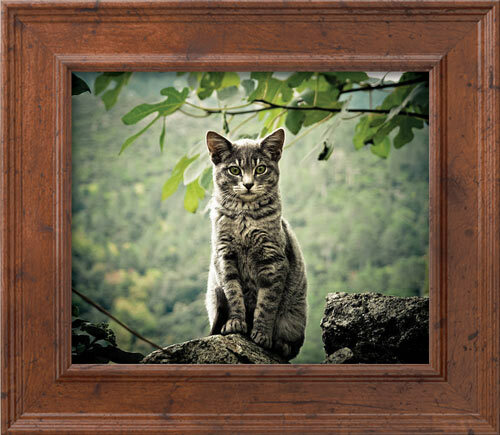 The frame is very rustic, yet classic. The photos don't do it justice! The knotty elements are really beautiful. You can't go wrong with this frame! The frame is made of, what I believe is some kind of wood composite, with a kind of shiny wood-look paper glued over it. I wouldn't have purchased it, but client wanted it. Also, I asked and paid for acrylic and foamcore, which was not in the package. The company did rectify this situation, but then the client's order wasn't ready in a timely matter. Hello Cecilia. Thank you for your feedback and allowing us to make things right with you. 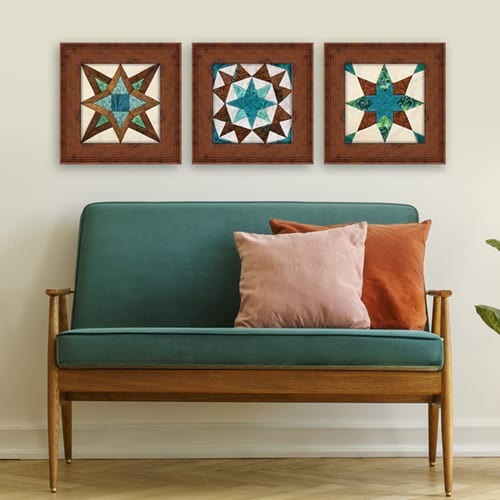 We have a wide variety of frames, and the Rustic Americana Collection consist of frames made from eco-friendly upcycled wood fiber. The RST3 has a wood grain design wrapped on the moulding. 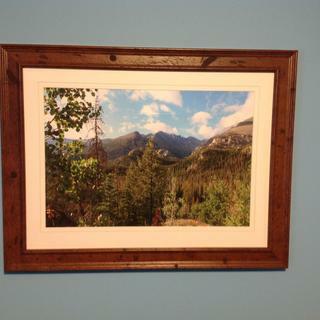 Please take a look at our Kentucky Barnwood or Barnwood Collection to see our %100 Rustic Frames. We hope you look to us for your future framing needs. You can trust that we will try our best to deliver all orders in a timely fashion. If you need further assistance, please let us know. Happy Framing! This is now my 4th frame from Pictureframes.com and they are flawless. The quality of the frame, mats, acrylic and packaging are very high. The pricing is much more reasonable than a custom job at Michaels. I will definitely be buying more in the near future. I ordered 6 framed pictures. They did a great job with the printing and the frames were perfect. The bar wood matched my rustic decor nicely. I don't usually write reviews but I am so pleased with my order I have to endorse picture frames.com. 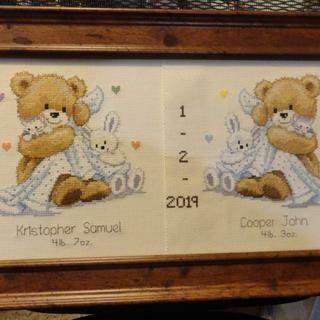 The frame made a great frame for my cross stitch of for my new twin great grandsons. The frame was easy to work with. 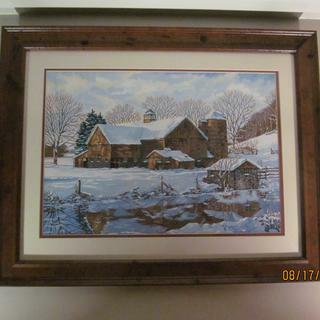 I was looking for a quality frame to go with some rustic watercolor painting and this frame fit the bill. 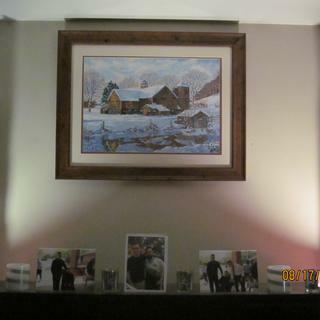 My Painted Old Barn Scence Double Matted and Framed. 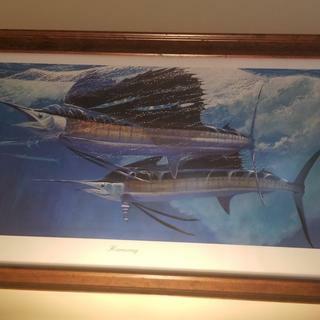 The frame was of excellent quality. Only problem was that the double mat boards were not taped together. Had to buy double sided sticky tape to put them together. When put together, the inner mat was not perfectly symmetrical. However, not noticeable to others except for me. Having cut mats before, wish the company cut them together as a set pair taped together. The results would then have been perfect. I bought this frame and a double mat for a photograph of a beautiful elk stag that I have hung in the hallway. The frame is a beautiful color and design but ideally, having options for different widths- i.e. wider for this large photo with mats would be preferred. Two inches in width doesn’t really make a statement for this piece. Three inches or so would be perfect. Overall, the framing is very nice and the workmanship is excellent ! I wanted something rustic that looked like barn wood . The rustic look complements a needlepoint project with a nature scene. Plus, I've used PictureFrames dot com twice before and have been very pleased with my orders. I feel confident measuring my artwork, selecting mats and ordering from them. Color was right, and I could get the size I wanted. This is for an original cross stitch I made for my mother. The frame style fits both the cross stitch and my Mom's country colonial aesthetic. I love the richness of the brown. I chose this style because it is a gift for my daughter and she likes the rustic look in her home. I have purchased these in the past and I am very pleased with the quality and the color is nice on my landscape paintings. 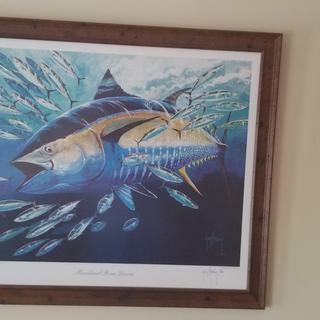 I choose these frames because I thought they would compliment my mother's paintings well. Is it possible to buy the acrylic front and no foam backing (my print is already on foam)? BEST ANSWER: Hello Susan! Thank you for your inquiry. Yes, you can absolutely order the acrylic front without the foam core backing. This request must be made over the phone with one of our skilled customer care representatives. Please give us a call at 1-800-332-8884. 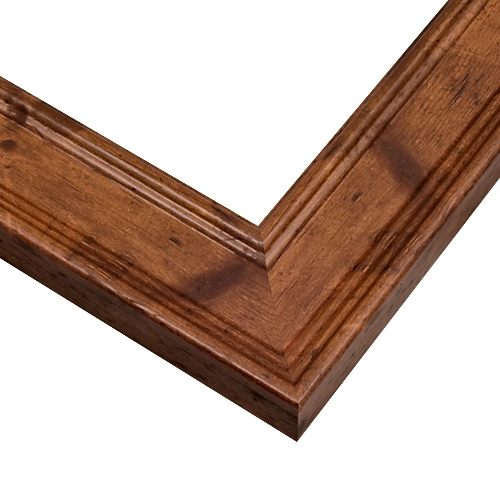 We look forward to providing you with your framing needs! What hanger is on the back of the frame for hanging (i.e., sawtooth, D-ring etc.)? BEST ANSWER: Hello! Thank you for your inquiry. The hanger for this frame will be d-rings with hanging wire. Please let us know if you have any additional questions. Happy Framing!